Upgrade Your Lost Arts And Increase Your Power! Your Herald has returned from the far reaches of the realm with wondrous news! Many of the Lost Arts in your Castle can now be Upgraded to even higher Levels! Upgrading Lost Arts benefits your Castle and Units! A Bonus button will be visible inside the Lost Art’s window. Click it to see what Bonuses are given with the Upgrade Levels! Upgrading to some of these new Lost Art Levels may require the use of Upgrade Sketches, which you can get from the Black Market or by taking part in select in-game Events! Time to fly, my Lord! 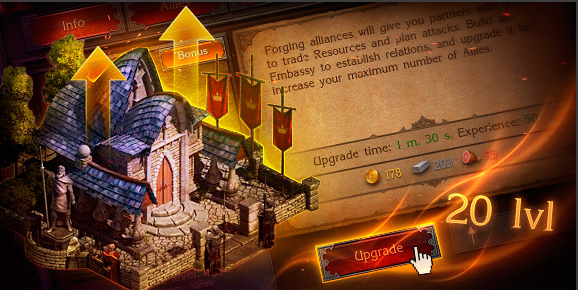 Discover and Upgrade Lost Arts to make your Castle and Units stronger than ever before! A Powerful New Castle Skin! Unlock Special Bonuses With Upgrade Sketches!